Day 1 of Delhi International Queer Theater and Film Festival organized by Harmless Hugs and Love Matters Kick started with inauguration by eminent personalities including Prince Manvendra, Jess Dutton (Deputy High Commissioner from Canada to India), Vithika Yadav (Country Head, Love Matters India) along with founder of HH Vinay Kumar. 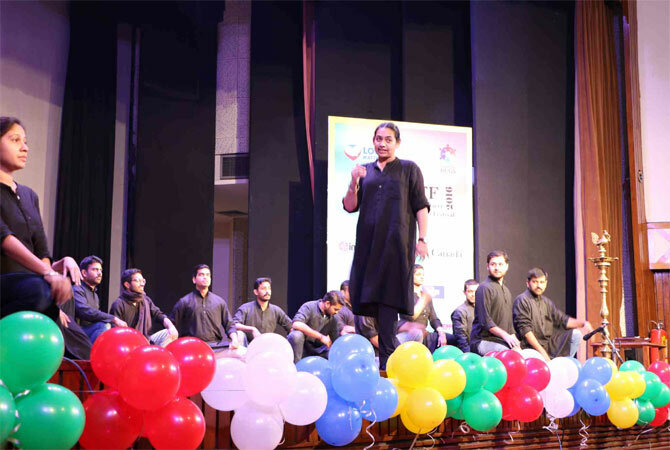 The event started with a power packed theater called Pechan by Asmita Theater Group and was followed by a number of short movies. The event continued with a play by a German couple – I step on Air and then ‘Hum to Bolenge’ by Sangwari. Post that, renowned Artist Piyush Mishra arrived at the venue and launched the collection of short stories. Other prominent personalities including Arvind Gaur, Shilpi Marwah from Asmita and leaders and representatives of other partners like Impulse New Delhi, India HIV/AIDS Alliance, Youth LEAD India, Ketto, The Education Tree and more. The event was concluded with another powerful play Lihaaf by Asmita Theater Group.